The United States Mint produced 1,051,342,000 1957-D Lincoln pennies at the mint facility in Denver, Colorado. The Denver Mint produced its first coins in 1906, consisting of only silver and gold coins. It wasn't until 1911 that the first Lincoln cents rolled off the coining presses. It is still located at its original location at 320 W. Colfax Ave, Denver, CO where regularly scheduled tours are conducted almost daily. Originally, all coin dies were manufactured at the Philadelphia Mint location and then shipped to Denver. In more recent years, the mint has shifted some die making operations to the Denver mint facility. Through the use of modern technology, the same high-quality dies are produced regardless of the location of the mint facility. 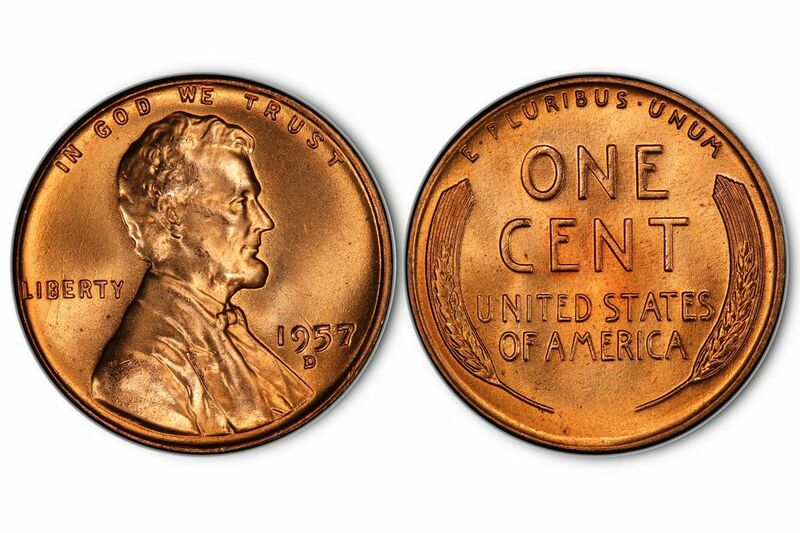 The United States first produced Lincoln cents in 1909 to mark the 100th anniversary of President Lincoln's birth. President Theodore Roosevelt recruited Victor David Brenner in 1908 to help with the overhaul of the United States coinage system. Brenner was tasked with creating a new design for the penny while Augustus Saint-Gaudens redesigned the ten-dollar and twenty-dollar gold coins and Bella Lyon Pratt was tapped to redesign the $2.50 and $5 gold coins. These artists rounded out what is commonly known as the Renaissance of American Coinage. A plaque of President Lincoln in Brenner's studio inspired President Roosevelt to select Lincoln as a subject for American coinage. This plaque served as a basis for Brenner's initial design. The coin features a profile view of President Lincoln from the shoulders up with IN GOD WE TRUST above the head, LIBERTY to the left, and the date and mint mark to the right. The reverse features two stalks of wheat aligned on either side. E PLURIBUS UNUM arcs across the top, ONE CENT is in the center, and UNITED STATES OF AMERICA directly beneath that. Brenner placed his trio of initials (V. D. B.) on the bottom of the reverse on the original 1909 issue. The use of all three of his initials resulted in outrage by traditional coin designers at the mint. After a short iteration of minting, the dies were modified with the initials being removed. Most collectors will be able to find circulated coins in Very Fine to Extra Fine condition. This is mainly because the wheat stalk reverse design was replaced with the Lincoln Memorial design in 1959. As is always the case, the public began to remove the "old" design from circulation to be saved for future generations. This hoarding of coins is also yielded great quantities of uncirculated 1957-D Lincoln pennies as the coin collecting community was in a "roll collecting" mentality during this time frame. Although the mintage for this particular issue exceeded one billion coins, most uncirculated coins are usually well struck with full details. A collector of limited means can reasonably obtain uncirculated examples with full mint-red color all the way up through MS-66 Red. An average uncirculated specimen (MS-63) will cost about seventy-five cents. The highest grade that a third-party certification service has ever issued to a 1957-D Lincoln cent is MS-67+Red (PCGS) that sold for $2,640 in August 2018 at a Stack's Bowers auction. Higher grades are elusive because the bulk handling of coins at the Denver mint resulted in all coins having some minuscule bag marks. Problem free circulated examples can be purchased for approximately 10 to 15 cents. A search of over eighteen years of auction records from Bowers & Merena, David Lawrence Rare Coins, eBay, Great Collections, Heritage Auctions, and Stack's Bowers has resulted close to 1,000 1957-D Lincoln pennies being auctioned. With over one billion 1957-D Lincoln cents being produced at the Denver mint facility, one would expect multiple die varieties in this issue. However, die varieties experts John Wexler, Kevin Flynn, and Billy G. Crawford have only identified four different varieties. All of these varieties are classified as minor and add only a very small premium in value over a non-variety specimen. This variety exhibits nice doubling on the letters of LIBERTY and the motto. Additionally, there is a repunched mintmark that is shifted directly to the south. The second variety exhibits very minor doubling and notching on the letters of LIBERTY and the numeral “9” and the date. This is also an example of an extremely small doubling of the word LIBERTY and some evidence of doubling on the numerals “9” and “7” in the date. The final variety is extremely hard to identify due to only one diagnostic. Look for an extra eyelid to the southeast of the dominant eyelid.